Bexhill Town’s footballers came from 2-0 down at half time to earn a 2-2 draw at home to league champions Rye Town this afternoon (Saturday). A 90th minute header from Rhys Whyborne ensured both meetings between the clubs this season ended 2-2, with the home team scoring late on both occasions. 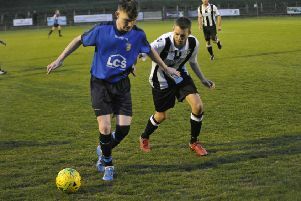 Bexhill Town defender Jack Cooper clears under pressure from two-goal Richard 'Alfie' Weller. Both clubs were missing several players for what proved to be a keenly contested and at times fiery Macron East Sussex Football League Division One encounter played in glorious spring sunshine at Bexhill Road. There wasn’t a great deal between the sides during the first half, although all bar one of the meaningful attempts at goal came from Rye. Joe Fraser blazed over when well placed to give Rye an early lead at the end of a decent counter-attack involving Chris Gould and Richard ‘Alfie’ Weller. Moments later Barnaby Osborne was denied by Bexhill goalkeeper Chris Anderson following a Gould corner. Rye drew first blood in the 25th minute. Dominic Cruttenden’s ball forward was missed by Bexhill centre-half Jack Cooper and Weller lifted a lovely finish over Anderson into the net. Midfield action from this afternoon's 2-2 draw. Gould went close with a spectacular angled strike from Osborne’s diagonal ball before Rye went two-up in the 36th minute. Anderson opted to use his boot rather than hands to deal with George Ball’s low cross and could only stab the ball to Weller, who turned it home. Weller thought he had his hat-trick a couple of minutes later when he controlled Cruttenden’s long free kick before poking home only for the referee to penalise him for handball. Gould then fired just over from the corner of the box. Bexhill threatened Rye’s goal for the first time in the second minute of first half added time. Billy Trickett’s shot from a clever Ben Cornelius free kick was blocked on the line by Luke Willis. Bexhill upped the ante during the opening 15 minutes of the second period and Regan Smith pulled a shot wide from just inside the area. Rye Town defender Dominic Cruttenden slides in on Regan Smith, scorer of Bexhill Town's opening goal. Smith did find the target, however, on the hour. Ross Cook played a good ball over Rye’s defence and Smith ran through before lifting the ball neatly over Rye goalkeeper Adam Hurley. Bexhill were unable to really build on the goal, however, and Rye started to spend more time in home territory. Weller rolled the ball home following Charlie Stevens’s headed throughball only to be denied by a slightly late offside flag and the same player then chipped just wide. Rye were looking pretty comfortable on the whole, but Bexhill conjured up a late equaliser. Cornelius delivered a decent cross from the right and Rhys Whyborne, who had come up from the back, glanced a neat header into the far corner. Bexhill had one last half-chance in the last of six minutes of added time, Ben Elphick heading just wide from Josh Clifford’s left wing corner. Rye’s Pikes Cleaning man of the match was Osborne and their match sponsor was Peter Ashbee. Rye Town celebrate after receiving the Macron East Sussex Football League Division One trophy. The result puts Rye 10 points clear at the top of the table having now completed their league programme, while Bexhill need three points from their last two games to secure the runners-up spot. Rye were presented with the league trophy after the game. Bexhill: Anderson, Cornelius, Clifford, R. Whyborne, Cooper, B. Elphick, S. Whyborne, Cook, Smith, Dovla, Trickett. Subs not used: P. Elphick, Ottley. Rye: Hurley, Wilson, Willis, Cruttenden, Henham, Sarkies, Osborne (Earl 82), Fraser (Kipps 77), Weller, Gould (Stevens 60), Ball. Subs not used: Ridgers, Wall.